Reich v. Lopez, et al. – On March 10, 2017, Jeff Grell presented oral argument to the United States Court of Appeals for the Second Circuit on behalf of the Honorable Otto Reich, former U.S. Ambassador to Venezuela. The argument was dominated by the issue of whether the defendants’ alleged acts of bribery were sufficiently related to the defendants’ alleged acts of wire fraud to form a pattern of racketeering and whether the district court erred in dismissing the Ambassador’s RICO claims. Click here to listen to the argument. Ultimately, the Second Circuit affirmed the district court’s determination that the acts of bribery were not sufficiently related to the acts of wire fraud. The Supreme Court further denied the Ambassador’s petition for writ of certiorari on October 2, 2017. Jeremiah’s Int’l Trading Co. v. Calderone, et al. – RICO defendant’s motion to dismiss argued that the plaintiff failed to plead the defendant’s operation or management of the enterprise and failed to plead a pattern of racketeering. Defendant’s motion was denied. Jeff Grell consulted with the plaintiff’s lead counsel, Michael Beltran, in opposing the defendant’s motion to dismiss. United States District Court for the Middle District of Florida – Order of the Honorable James D. Whittemore (Oct. 28, 2014). Estate of David R. Foster v. Gomer, et al. – RICO defendant’s moved to dismiss the complaint on the basis of the court’s lack of personal jurisdiction. Motion denied. Given that the defendant is a partner at a law firm and has previously served as counsel for co-conspirator’s estate, which is located in California, the court determined that the defendant would not be unduly burdened by defending herself in California. Jeff Grell is co-counsel for plaintiffs, along with Blake & Associates (Boston, MA). United States District Court for the Central District of California – Order of the Honorable A. Howard Matz (Jan. 16, 2013). Estate of David R. Foster v. Gomer, et al. – Plaintiff survives motion to dismiss RICO claims. Plaintiff’s RICO claims are predicated on acts of extortion, mail / wire fraud, and interstate transportation of stolen property arising out of defendants’ management of the affairs of a vulnerable elderly person. Jeff Grell is co-counsel for plaintiffs. United States District Court for the Central District of California – Order of the Honorable A. Howard Matz (Feb. 15, 2012) (available on PACER). Stueve, et al. v. Novell, et al. – Plaintiff survives demurrers seeking to dismiss RICO claims (see Motions 11, 12 and 13). Jeff Grell was plaintiff’s co-counsel. Superior Court of the State of California (Orange County) – Order of the Honorable Nancy Wieben-Stock (Oct. 21, 2011). Marini, et al. v. Adamo, et al. 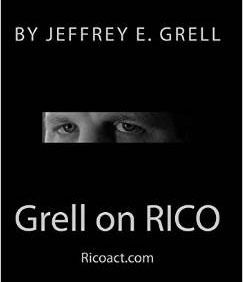 – Plaintiff, whose counsel retained Jeff Grell as a consultant, defeats motion for summary judgment to dismiss RICO claims. United States District Court for the Eastern District of New York – Opinion of the Honorable Joseph F. Bianco (Sept. 26, 2011). St. Croix Printing Equipment v. Sexton, et al.– Jeff Grell’s client (the plaintiff / counter-defendant) successfully brings a motion for summary judgment, obtaining dismissal of Defendants’ counterclaims under the Lanham Act. United States District Court for the District of Minnesota – Opinion of the Honorable Paul A. Magnuson (May 30, 2008). Shoreline Amphitheatre Partners, et al. v. City of Mountain View, et al. – Defendant / Cross-plaintiff, whose counsel retained Jeff Grell as a consultant, defeats motion for summary adjudication on its RICO claims. Superior Court of California, County of Santa Clara – Opinion and Order of the Honorable William J. Elfving (Dec. 27, 2005). Brutlyn, N.V. v. Anthony Gagliano Co., Inc.– Defendant, whose counsel retained Jeff Grell as a consultant, obtains summary judgment on RICO claims brought against it. United States District Court for the Eastern District of Wisconsin – Decision and Order of the Honorable William E. Callahan, Jr. (Nov. 29, 2005). Heaven & Earth, Inc. v. Wyman Properties Ltd. Partnership, et al. – Defendant represented by Jeff Grell obtains dismissal of consumer fraud claims; the Court determines, however, that the plaintiff’s RICO claims are adequately pled. United States District Court for the District of Minnesota – Memorandum Opinon and Order of the Honorable Donavan W. Frank (Oct. 21, 2003). Marshall Wolf Automation, Inc. v. Kostopolous – Plaintiff represented by Jeff Grell defeats motion for summary judgment to dismiss RICO claims. United States District Court for the Northern District of Illinois – Opinion of the Honorable Blanch M. Manning (Aug. 15, 2002).